How Much Tuna Can You Eat During Pregnancy? If you are pregnant, adding tuna to your diet will help ensure the normal growth and development of your unborn baby. Tuna provides a wealth of benefits with protein, omega-3 fatty acids and nutritional content. But making an informed choice about the type of tuna and the amount that's safe to consume is important. The amount of tuna pregnant women and breastfeeding moms should eat depends on the type of tuna and your body weight. Tuna belongs to the Scombridae family of fish and are caught primarily in the Pacific Ocean. 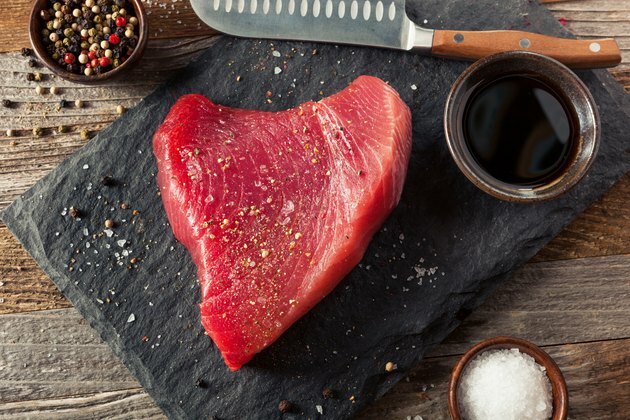 Of the many species of tuna, there are five main types that are commonly consumed. It is important to familiarize yourself with these types because each has different issues in terms of safety and how much you should eat if you are pregnant. Skipjack: This fish is the most common species used in pouched and canned light tuna. Skipjack can weigh up to 40 pounds, but the smaller fish are more typically used for consumption. Yellowfin: Yellowfin is sometimes called "ahi" tuna. It has a more pronounced flavor than Albacore and is often used in canned tuna. These fish can grow up to 7 feet long and weigh up to 440 pounds. Albacore: Albacore can grow up to 4.2 feet and weight 88 pounds. Albacore is the only kind of tuna that is allowed to be marketed as "white" tuna meat. It is often use in canned tuna for its mild taste. Bigeye: Bigeye tuna is sometimes used in sashimi. It has a mild flavor and varies in length from 1 to 7 feet. Bluefin: A tender, delicate-flavored fish, bluefin is used almost exclusively for sushi dishes and not in canned tuna. Bluefin is the largest of the tuna species and can weigh over 1,000 pounds. Mercury can come from natural sources in the environment, such as volcanic activity, or from man-made, industrial pollutants. This toxin can make its way into the ocean, where it can accumulate in the flesh of tuna and other fish, according to the Department of Environmental Conservation. Unfortunately, the mercury levels in many fish continue to rise each year, as confirmed by a 2017 study published by the Environmental Toxicology and Chemistry. The mercury level in fish is not reduced by cooking or cleaning. The large predator fish, which are highest on the food chain, contain the most mercury. This concentration of mercury can be a serious health concern, especially for pregnant women and young children. Although certain types of tuna are safe and a healthy addition to your diet, the bigger kinds should be avoided. A good rule to follow: The larger and older the tuna, the bigger the risk. Mercury in fish can affect the development of the brain and nervous system of the fetus. Eating toxic fish, even before you are pregnant, can be dangerous and can be transferred to your baby by breast milk. What Are the Effects of Mercury? It is reported that about 75,000 babies born every year have an increased risk of learning disabilities due to mercury exposure from their mothers, according to the Natural Resources Defense Council. The Food and Drug Administration (FDA) and the EPA have issued recommendations regarding fish that are safe to eat for women who are pregnant or may become pregnant, or are breastfeeding. The FDA guidelines uses a chart that defines the safest fish as "best choices," followed by "good choices," and finally "choices to avoid." Recommendation is two to three servings (7 to 10.5 ounces) of fish per week for pregnant and breastfeeding mothers, and women of childbearing age —16 to 49 years; one to two servings (2 to 4 ounces) of tuna per week for children over 2 years of age. Good choices: Albacore tuna, fresh, canned or frozen, and yellowfin tuna. Recommendation of ine serving of fish (3.5 ounces) a week for pregnant or breastfeeding women and parents of young children. These types of fish may contain high levels of mercury that are considered unsafe and should not be eaten if you are pregnant. About 70 percent of canned or pouched tuna is made from skipjack. Because it's a small, fast-maturing tuna, the level of mercury in its flesh is minimal, according to National Geographic. Albacore is used in the chunk-type "white meat" style of canned tuna. The FDA safety standard is based on a maximum of 0.1 micrograms of mercury per kilogram of body weight per day. But how do you know just how much mercury is in a can of tuna and whether it's safe? Mercury content standards for consumers are regulated, and the testing is extremely rigorous. An FDA assessment tested various fish and found that canned light tuna has .128 ppm and canned chunk white tuna had .135 ppm, both far below the FDA threshold for harmful levels. The FDA's Net Effects Report, which is based on 100 peer-reviewed studies, concluded that tuna is very safe for women to eat during pregnancy. Skipjack tuna contributes 48 percent DV for protein per 3 ounces. It's low in saturated fat and rich in omega-3 fats, B vitamins, selenium, iron and other important minerals. Each nutrient has a role in ensuring you have a healthy pregnancy and your baby develops properly. Vitamin B12. Skipjack tuna is high in vitamin B12, supplying 36 percent DV per 3-ounce serving. Vitamin B12 may help prevent spina bifida and other central system birth defects. A deficiency in B12 is associated with an increased risk of preterm and low birth weight, and potential delays in typical developmental milestones. Riboflavin (vitamin B2). With 7 percent DV for riboflavin, tuna helps your body produce energy — needed for delivering your baby. Riboflavin also promotes the development of baby's muscles, nerves, bones, skin and vision. A deficiency in riboflavin may put you at risk for developing preeclampsia. Niacin (vitamin B3). In addition to helping your baby's brain develop, niacin may decrease the negative symptoms of pregnancy including nausea, indigestion, anxiety and migraines. Skipjack tuna provides 100 percent DV with 18 milligrams per 3-ounce serving. Vitamin B6. Another vitamin essential for the fetal brain and nervous system development, B6 aids in the production of essential neurotransmitters that may help to alleviate nausea and vomiting side effects of pregnancy. A 3-ounce serving of tuna supplies 49 percent DV for B6. Phosphorus. Phosphorus is for healthy bones, muscle contractions, kidney function and nerve signaling as well as tissue and cell repair. Skipjack tuna supplies 285 milligrams of phosphorus or 28 percent DV per serving. Selenium. A mini-review from the Journal of Nutrition and Food Sciences in 2016 reported that a deficiency of selenium may lead to spontaneous abortion, preeclampsia and low birth weight. A serving of tuna provides 47 micrograms, or 67 percent DV. Pantothenic acid. Pantothenic acid can help during your pregnancy by easing painful muscle cramps and by releasing important stress-relieving hormones. Skipjack tuna contributes 4 percent DV for pantothenic acid in each 3-ounce serving. Perhaps the biggest benefits of eating tuna come from polyunsaturated omega-3 fatty acids, and tuna contains 531 milligrams per serving. Omega-3s are vital for the neurological and visual development of your baby, according to American Pregnancy Association. A 2018 review, published in Cochrane Database of Systematic Reviews, found that consuming omega-3 contributed to lowering rates of preterm birth, which is the major cause of death in the first 5 years of life. National Geographic: Tuna Lover's Dilemma: To Eat or Not to Eat? Can I Eat Mackerel When Pregnant?